INTRODUCTION: MALFUNCTION OF A PERITONEAL DIALYSIS (PD) CATHETER DUE TO OMENTAL WRAPPING IS A COMMON COMPLICATION THAT USUALLY OCCURS SHORTLY AFTER INSERTION. PROPHYLACTIC OMENTECTOMY AND OMENTOPEXY HAVE BEEN DESCRIBED IN A LIMITED NUMBER OF STUDIES AS SUCCESSFUL METHOD OF OVERCOMING THIS COMPLICATION. 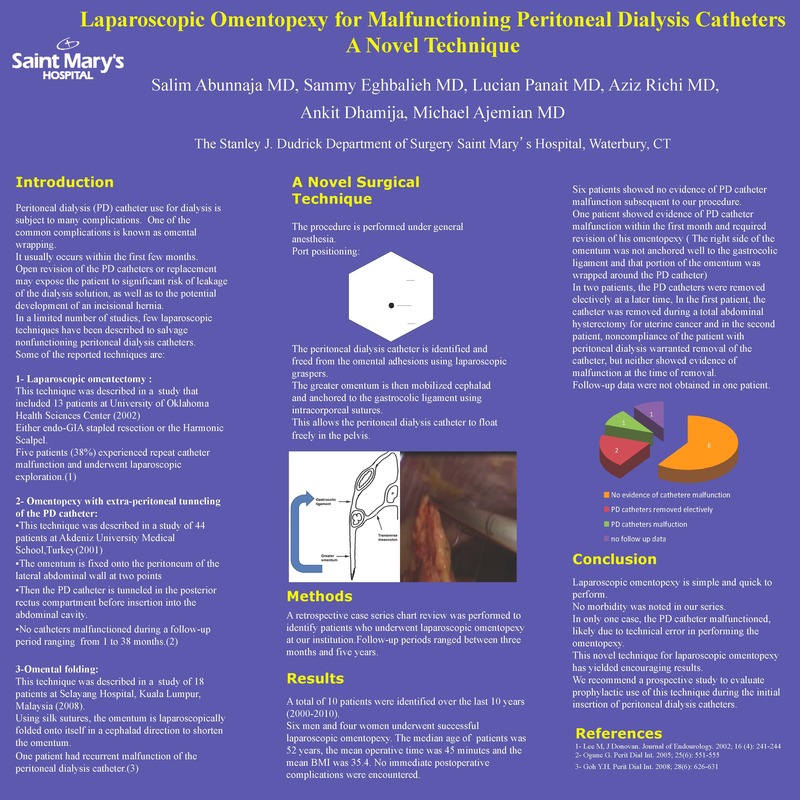 THE PURPOSE OF OUR STUDY IS TO DESCRIBE OUR EXPERIENCE WITH A NOVEL TECHNIQUE, LAPAROSCOPIC OMENTOPEXY, IN THE TREATMENT OF MALFUNCTIONING PERITONEAL DIALYSIS CATHETERS. METHOD(S): A RETROSPECTIVE CASE SERIES CHART REVIEW WAS PERFORMED TO IDENTIFY PATIENTS WHO UNDERWENT LAPAROSCOPIC OMENTOPEXY AT OUR INSTITUTION. THE PROCEDURE WAS PERFORMED UNDER GENERAL ANESTHESIA.AFTER GAINING LAPAROSCOPIC ACCESS TO THE PERITONEAL CAVITY; THE PERITONEAL DIALYSIS CATHETER WAS IDENTIFIED AND FREED FROM THE OMENTAL ADHESIONS. THE GREATER OMENTUM WAS MOBILIZED CEPHALAD AND ANCHORED TO THE GASTROCOLIC LIGAMENT USING INTRACORPOREAL SUTURES, LEAVING THE PERITONEAL DIALYSIS FREE IN THE PELVIS. A VIDEO HIGHLIGHTING THE ESSENTIAL STEPS OF THE PROCEDURE WILL ACCOMPANY THIS PRESENTATION. RESULTS: TEN PATIENTS UNDERWENT SUCCESSFUL LAPAROSCOPIC OMENTOPEXY. FOLLOW-UP RANGED BETWEEN ONE MONTH AND FIVE YEARS. NO IMMEDIATE POSTOPERATIVE COMPLICATIONS WERE ENCOUNTERED. SEVEN PATIENTS SHOWED NO EVIDENCE OF PD CATHETER MALFUNCTION. IN TWO PATIENTS THE PD CATHETERS WERE REMOVED AT A LATER TIME: IN THE FIRST PATIENT, THE CATHETER WAS REMOVED DURING A TOTAL ABDOMINAL HYSTERECTOMY FOR UTERINE CANCER; IN THE SECOND PATIENT, NONCOMPLIANCE OF THE PATIENT WITH PERITONEAL DIALYSIS WARRANTED REMOVAL. NEITHER SHOWED EVIDENCE OF MALFUNCTION AT THE TIME OF REMOVAL. FOLLOW UP DATA WAS NOT OBTAINED IN ONE PATIENT. CONCLUSION(S): LAPAROSCOPIC OMENTOPEXY IS A PROMISING TECHNIQUE, WHICH IS SIMPLE, QUICK AND INEXPENSIVE TO PERFORM. THERE WAS NO MORBIDITY OR PD CATHETER MALFUNCTION IN OUR SERIES. WE RECOMMEND A LARGER PROSPECTIVE STUDY TO EVALUATE THIS TECHNIQUE IN THE FUTURE.